The UnihaulER tire gives more strength to carry heavy loads that have to turn left and right in limited spaces. Radial Bead 1" V. UnihaulER Bead 3"
Taking in consideration all aspects of getting the most amount of coal from inside a mountain to the surface, and on to its final destination, has led to the development of "The Unihauler Mine Tire". 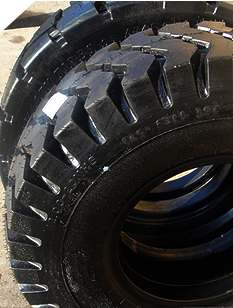 A work in progress that began in 1977, and continues today, has seen many changes and refinements in the construction process of The Unihauler Mine Tire. 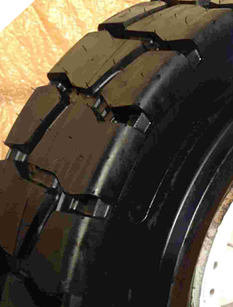 Dual bead construction, sidewall protection, rim guards, lug stabilizer bars, compound mixtures, both natural rubber and synthetics, are characteristics that has taken The Unihauler Mine Tire to unprecedented levels in under-ground coal production.